You can add a touch of mod 60's style to any blouse or dress with the addition of a Peter Pan collar. These simple, rounded collars are a breeze to sew, and you can use them to totally transform your wardrobe. Because each blouse or dress has a slightly different neckline shape, you can't use a pattern to make this type of collar. 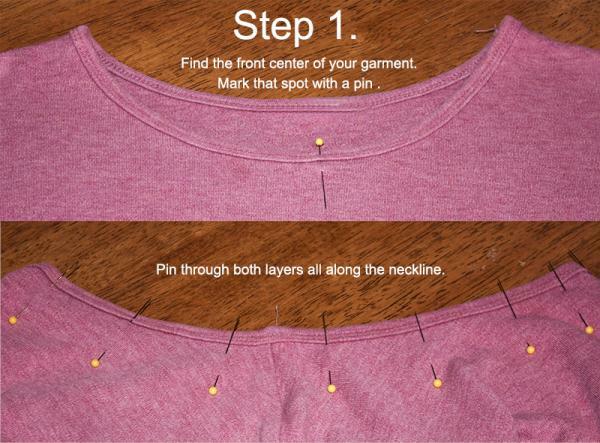 Instead, you can follow these simple instructions to create one that perfectly fits your garment. It's important that you select a blouse or dress that does not currently have a collar since these make the easiest types of garments to modify. Making this type of collar does take a bit of previous sewing experience, but you don't need to be an expert. Expect to spend about an hour on this project. Spread your pressed garment out on your work surface. Locate the center point of the front collar and mark this spot with a pin. Grasping the garment at the neck hole, fold it in half from front to back so the shoulder seams match up. Pin through both layers, all along the neckline, to make sure the garment stays in this position. Lay your garment on top of a piece of craft paper or newsprint, being careful to preserve the natural curve of the garment's neckline. Use a pencil to trace the curve of the neckline. Remove the garment and set aside. Starting at one end of the line you drew, draw a rounded collar shape. You can make your collar any width you like. Add a rounded shape to the back as well. Draw another line 1/4 inch outside the entire collar pattern to create your seam allowance. Cut out the pattern on the seam allowance line. 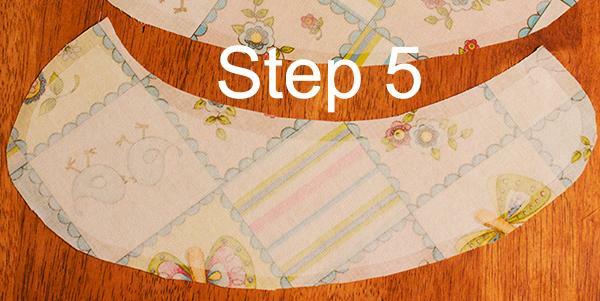 Use the collar pattern to cut four pieces of cotton fabric. Set the fabric pieces aside. Cut off the seam allowance from your pattern. Use this modified pattern to cut two pieces of fusible interfacing. Place one fabric collar piece right side down on your work surface. Align one interfacing piece so it is centered with the fusible side down. Press to adhere according to the manufacturer's instructions. Repeat with the another fabric collar piece and the other interfacing piece. Place one stiffened collar piece with the interfacing side down on your work surface. Stack a fabric collar piece on top and pin all the way around. Starting along the top edge of the collar, sew almost all the way around both pieces using a 1/4-inch seam allowance. Stop sewing a few inches from where you started to allow you to turn the collar. Repeat with the other two pieces. Clip the corners and curves on one collar piece and then turn it right side out. Use a bone folder or chop stick to get crisp points and seams. Press with the iron. Repeat this process with the other collar piece. Locate the center of the neckline on your garment. Pin the collar in place along the neckline, tucking in any raw edges that are left from turning it. Set your sewing machine to a 3.0 stitch length and top stitch along the top edge of the collar to affix it to your garment. Repeat with the other section of collar to complete the project. Although the process requires a bit more sewing experience, you can also replace an existing collar with a Peter Pan version. 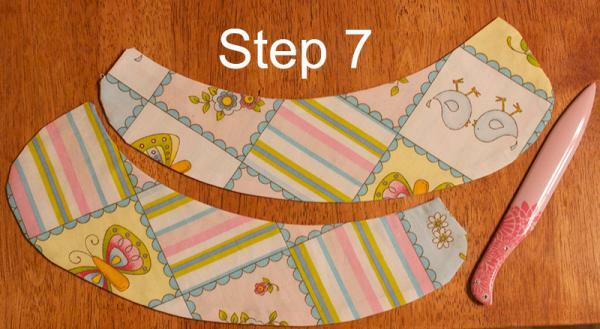 The easiest way to do this is to use the existing collar as a pattern. In addition to the tools and supplies for adding a collar, you'll also need a seam ripper to remove the existing one. Use the seam ripper to remove the existing collar from the garment, being careful not to damage the fabric as you do so. Spread the old collar on the newsprint or craft paper and trace around it, noting which side attaches to the garment. Remove the old collar from the paper and adjust your drawing to give the collar the classic rounded shape you need. Draw another line 1/4 inch outside the collar shape on all sides except where the collar attaches to the garment. This will be your seam allowance. Cut out the pattern. Cut two collar pieces from the white fabric, according to your pattern. Cut off the seam allowance on your pattern and cut 1/4 inch from the edge that attaches to the garment. Then use this version of the pattern to cut a collar piece from the fusible interfacing. Center the interfacing, adhesive side down, over the wrong side of one of the fabric collar pieces. Use your iron to adhere the interfacing according to the manufacturer's instructions. Stack the two collar pieces with their right sides together and use pins to hold them in place. Sew around the sides and curves of the collar pieces, leaving the part that attaches to the garment open. Clip the curves. Turn the collar right side out and iron it. Slip the raw edge of the collar into the open area of your garment. Depending on how the garment is constructed, machine or hand sew the collar back in place. If you are not replacing an existing collar, choose a garment with a wide neckline, or front or back closure. If you select a clothing item that has a narrow neck hole that must stretch to go over your head, you may not be able to put it on once you've attached the collar. Try the paper pattern against your garment to make sure you like the fit. You may want to modify the pattern's shape before you proceed with cutting the fabric. Consider adding an embellishment to the collar. You could insert lace into the seam for a feminine touch, or you could embroider a cute design on the rounded edges. Although a Peter Pan collar is most common on a dark dress or top, you can shake things up by adding one to a casual piece like a tank top or T-shirt. 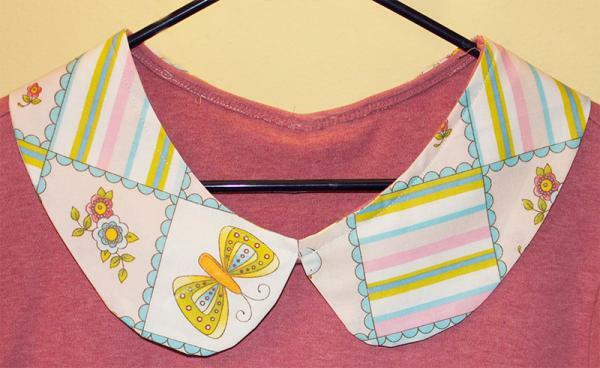 While white is the traditional choice for this collar, you can branch out with fun prints and bright colors too. If you're interested in performing some high-impact clothing alterations, adding a Peter Pan collar is a great way to refresh your look. With a few scraps of fabric and couple of hours of your time, you can completely transform the look of any blouse or dress.